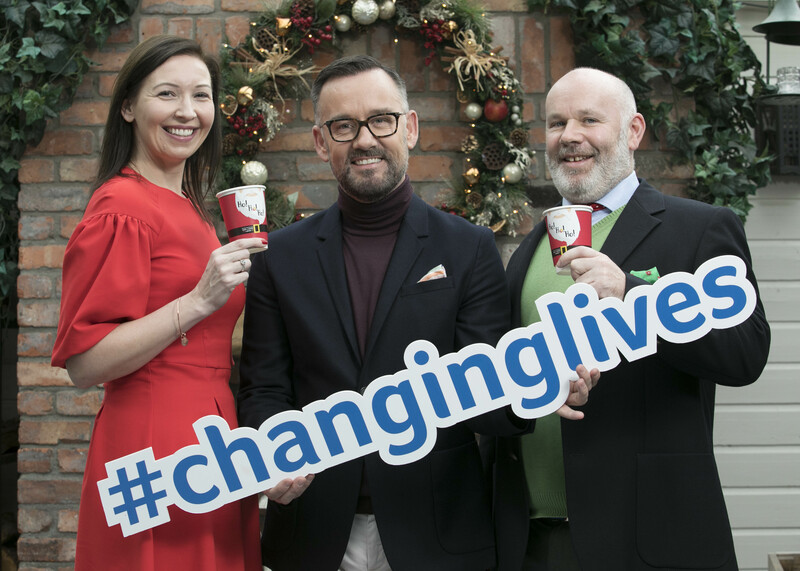 Caption: Caroline Burton, Head of Marketing, the Maxol Group, Irish broadcaster and fashion designer Brendan Courtney, and Drew Flood, Business Development Executive, AWARE at the launch for the AWARE Christmas charity fundraiser supported by Maxol. 10c from every hot beverage bought at a Maxol station goes to the mental health charity, Aware. Maxol, Ireland’s leading privately-owned forecourt and convenience retailer aims to raise €50,000 this Christmas for its charity partner AWARE, which provides support, education and information to people with depression, bipolar disorder and related mood conditions, and to those impacted by these conditions. Maxol is supporing the charity throughout the Christmas season by donating 10cent to AWARE for every hot beverage sold at its 115 company owned service stations nationwide. The Maxol AWARE partnership aims to promote positive mental health in communities nationwide. AWARE help many of the 450,000 people that are currently living with depression in Ireland. Making the choice to buy a hot drink at Maxol will go a long way for the mental health charity this Christmas. I’m really hopeful that people will get into the spirit of things and take a selfie with their cup for Aware!”. “Mental health is such an important issue in Irish communities and AWARE listens to the people that need it the most. I want to thank our loyal customers who have always supported our charitable efforts and to ask everyone to take a selfie with their coffee cup for Aware this Christmas and use #changinglives”. “The Maxol network provides a great opportunity for people in every community in Ireland to find out about AWARE. I really hope that people will choose to buy their cup of coffee at Maxol this Christmas knowing that a portion of it will go to a good cause”. This Christmas, take a selfie of you and your coffee cup and use the #changinglives. The charity partnership supports the range and level of important services delivered by AWARE in the Republic of Ireland and AWARE NI in Northern Ireland. The Maxol charity partnership supports the range and level of important services delivered by AWARE in the Republic of Ireland and AWARE NI in Northern Ireland. The Maxol Group was established in 1920 by William McMullan. The 4th generation of the family is Company Directors. Maxol makes a significant contribution to the economy on both sides of the border and markets a comprehensive range of oil and petroleum products to the Irish Market, through their Retail, Fuel Card and Lubricants divisions. The Maxol Group had an annual turnover of €551m in 2016. The company employs, directly and indirectly more than 1,000 people across the island of Ireland. Maxol has been investing and expanding in recent years and currently has a network of 234 service stations, of which 115 are company owned. The food brand Moreish – Fresh Food at Maxol was launched in 2014 and is currently in 31 Maxol service stations. It won ‘Best Oil Company Initiative’ at Ireland’s Forecourt & Convenience Awards 2015. Maxol M3 Mulhuddart Services in south Dublin won ‘Best Forecourt in Ireland’ at Ireland’s Forecourt & Convenience Awards 2016. Maxol M3 Mulhuddart Services received Large Format Honourable Mention at the International Convenience Retailer of the Year Awards 2017. Maxol Ballycoolin Services won Best New Forecourt at the Shelflife Awards 2017. Maxol A26 Tannaghmore in Northern Ireland won Best New Forecourt at the Neighbourhood Retailer Awards in 2017.